This recipe is perfect for breakfast, lunch (I am currently eating it for lunch as I type), breakfast-for-dinner or post-dinner snack! It’s super quick and easy, too. And… a huge hit with the kiddos. Score! I topped mine off with a whole banana sliced up. Perfection. I think cinnamon will be added next time… because you all know how much I love my cinnamon. If you have all of these ingredients in your kitchen, which you probably do, go make it! And let us know what you think. 1. Give your quinoa a quick rinse in a mesh strainer and cook in a medium pot according to the package instructions. 2. After quinoa has cooked, remove from heat. Stir in the diced apple, peanut butter and honey and stir until everything is combined thoroughly and you don’t have anymore globs of peanut butter left. 3. Serve warm. Top with sliced banana if you choose. Enjoy! NOTE: Makes 2 large servings. **Adapted from Oh Shine On. I unfortunately have no idea where I found this recipe. I found it probably a year ago and copied/pasted to my desktop and just stumbled upon it the other day and am so glad I did. These crackers are so simple and the perfect afternoon snack. The recipe made it sound like the dough would be the right amount for just one cookie sheet, my crackers were pretty thick – so next time I will divide the dough between 2 cookie sheets to create a thinner cracker, and also shorten the baking time. I’m also going to throw in 1/3 cup of cocoa powder to make them chocolatey and even more delicious! Goes perfectly with a cup of milk for the kids or a cup of coffee for mom and dad. Enjoy, and I challenge you to not eat them all in one setting when they are warm out of the oven… you’ve been warned. But in case you have leftovers, they keep great in an airtight container. 2. Mix together flour, cinnamon, baking powder, and baking soda. 3. Mix the butter and honey together in a separate bowl, and then add into the dry ingredients. 4. Mix well (I used my mixer, but you can mix by hand easily) and drop onto a greased, parchment-lined baking sheet. 5. Roll or press with your hands, out to the corners with a rolling-pin. (You could also roll out and cut with cookie cutters). 6. Bake for 8-10 minutes at 400 degrees. Watch carefully to avoid burning them. 7. Cut quickly when they come out of the oven. I used a pastry cutter on mine, but they would be so cute cut out with cookie cutters! 5 days in to our no grain challenge and we are going strong. Happy to have dabbled in grain-free cooking and baking over the past year, or this would have been really hard. However, it has been fun and easy. I’ve had ingredients stocked in my pantry (well, sad excuse for a pantry… more like shoved into my cupboard), and have been easily able to serve up 3 meals a day (plus a lunch to send with husband to work) and have literally avoided all grains. Too early to report any changes, but so far we feel great. These bars can be easily made Paleo if you sub the milk for coconut milk or almond milk. On to the berry bars. I froze a bunch or organic berries from the farmer’s market this summer. And boy, am I glad I did. Those blackberries were perfect in these bars. Although, you could use another berry, fresh or frozen. Or a combo of berries. Easy, super yummy, and grain-free. 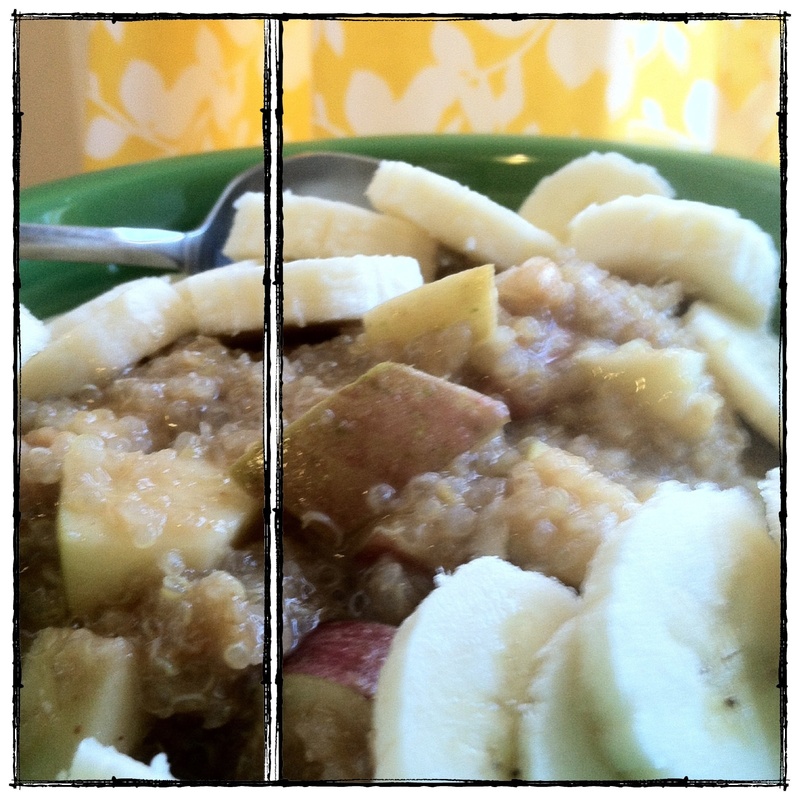 Even if you eat grains, give this one a try. Coconut flour is really healthy for you, and you might be surprised how you feel after a protein filled breakfast instead of a carb filled one. Give em a try! 1. Preheat oven to 350F. 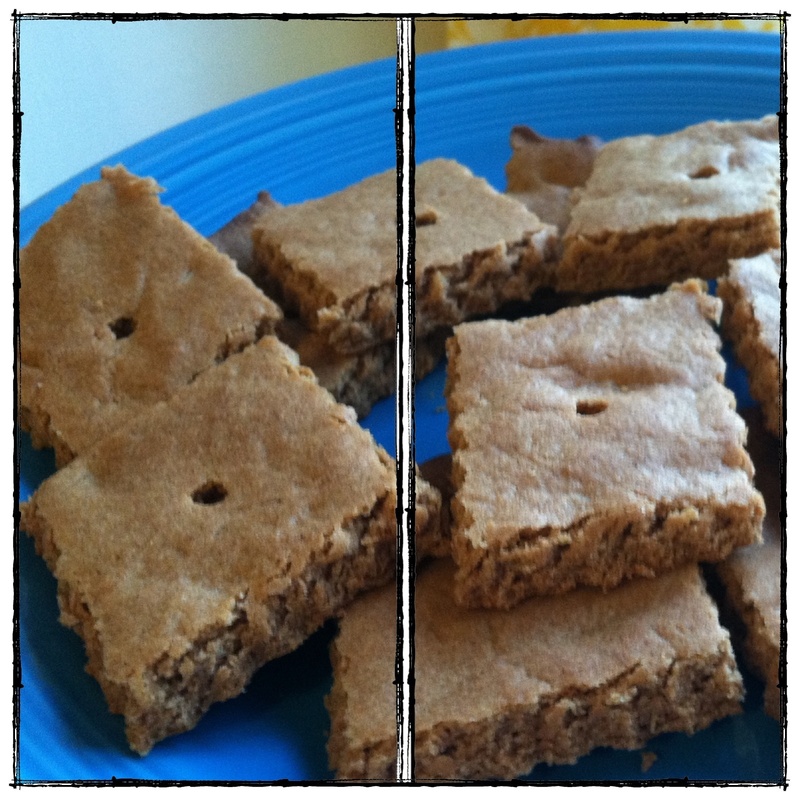 Grease 8×8 baking pan with coconut oil, set aside. 2. In a large bowl, or the bowl of your stand mixer, combine dry ingredients (coconut flour, shredded coconut, cinnamon, baking powder, baking soda, salt). Stir (or mix on low speed) to combine. 3. Add in wet ingredients (honey, smashed bananas, coconut oil, eggs, vanilla, milk). Stir (or mix on medium speed) until thoroughly combined. 4. 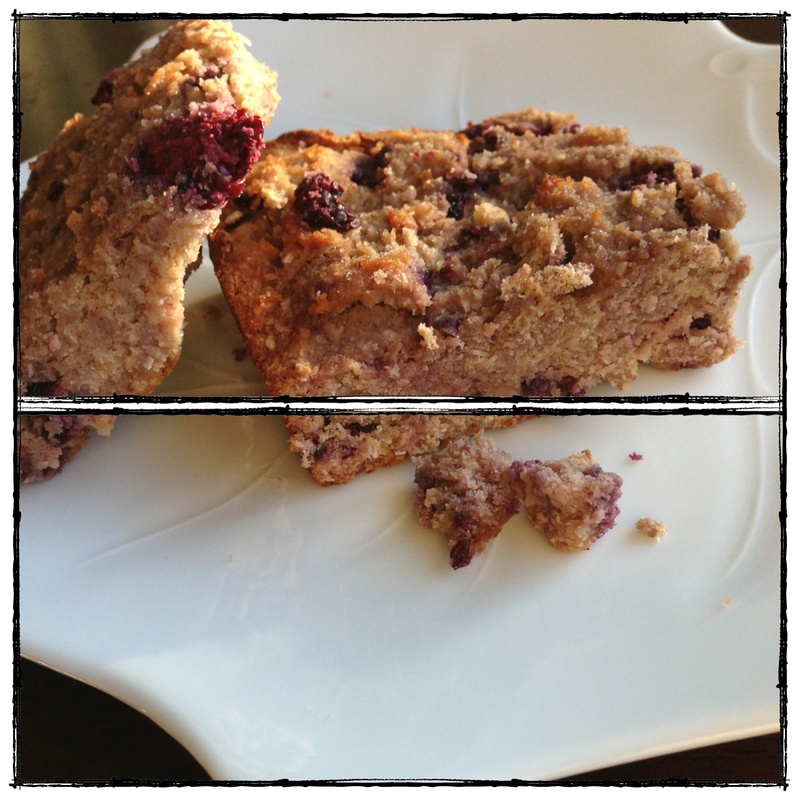 Fold in berries, and scoop into greased baking pan. This batter is similar in texture to cookie dough, so it won’t pour. And once you scoop or spoon it in, press down a bit with your spatula so that it is evenly distributed. 5. Bake for 35-40 minutes, until crust is golden. Wait until completely cool to cut. Serve with pastured butter, honey, or jam. Enjoy! **Adapted from What Runs Lori. I love my morning coffee with a little milk and honey in it, and this honey took my coffee to a new level. It is amazing. We also put it on toast, drizzled it over plain whole milk yogurt, put it on our oatmeal, and mixed it into warm lemon water when we were plagued with sore throats and colds this week…. (sorry for the lack of new posts, we’ve all be under the weather!)…. hoping to be better before the holidays. And before my last birthday in my 20’s tomorrow (YIKES!!)…. Where I intend on eating a disgusting amount of wild caught crab legs…. my all-time, favorite food of life. Back to this whipped honey. You just take equal parts raw, liquid honey and whip it with crystalized honey. Seriously, that is it. Mine lasted about a week in the cupboard before losing its “creaminess”…. so I just whipped it again and we are back in business. 1. Combine both types of honey in stand mixer with whisk attachment in place, and whip on low to medium speed for 10-15 minutes, or until mixture is white, thick, and creamy. 2. Store in a jar, at room temperature. So delicious. **Adapted from Bite My Cake. 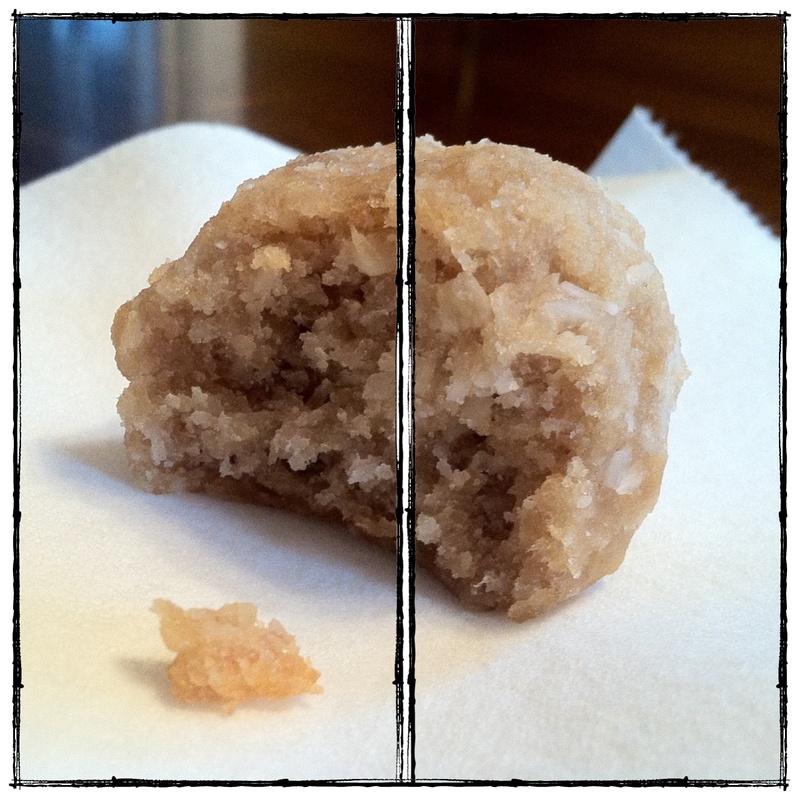 I was at a friend’s house a few weeks ago and she had these delicious banana coconut balls that she got from Whole Foods, I believe. They reminded me of the Coconut-Lemon Meltaways I have made before. I checked out the ingredients on the package, and they were pretty much the same plus or minus a few things, so I wondered if I could replicate it using bananas instead of lemon. I liked the lemon ones a lot, but banana anything is always going to be my favorite. They turned out really well, and they made the house smell fantastic as they baked. I love their texture. They are light, fluffy, and perfectly moist. I altered the original recipe and cut the sweetener in half, as bananas are plenty sweet and really don’t need a lot of added sweetener. I used raw honey, but these would be great with maple syrup, too. This was a tasty treat for the kiddos and they gave it their seal of approval. 1. Pre-heat oven to 250F. 2. Mix dry ingredients together and pour in the bowl of your mixer. 3. Mix honey, vanilla and mashed bananas together in a separate bowl and slowly add to the dry ingredients with the mixer on. 4. Once the wet and dry ingredients are mixed together, slowly stream in the melted coconut oil. Your mixture will thicken once the oil is added. 5. Form your balls on parchment lined baking sheets. I yielded about 20, but could’ve made my balls much smaller to yield more. Let them bake until they start turning a golden shade, about 45 minutes to an hour. Keep an eye on them, you don’t want them too brown though or they will be dry. **Adapted from Addicted to Veggies. Perhaps one of my most favorite things about avoiding processed food is the opportunity to be creative in the kitchen homemaking various goods. Today, we saw a kid eating a Fig Newton at the Farmer’s Market. My 3-year-old was asking what he was eating, and I told her it was like a cookie with fig jam inside….. She instantly suggested going home and making it ourselves, only better! I love that my kids are growing up thinking about what they eat, really enjoying creating things in the kitchen with me, and thinking that everything can be homemade. Sure, it takes work. And time. 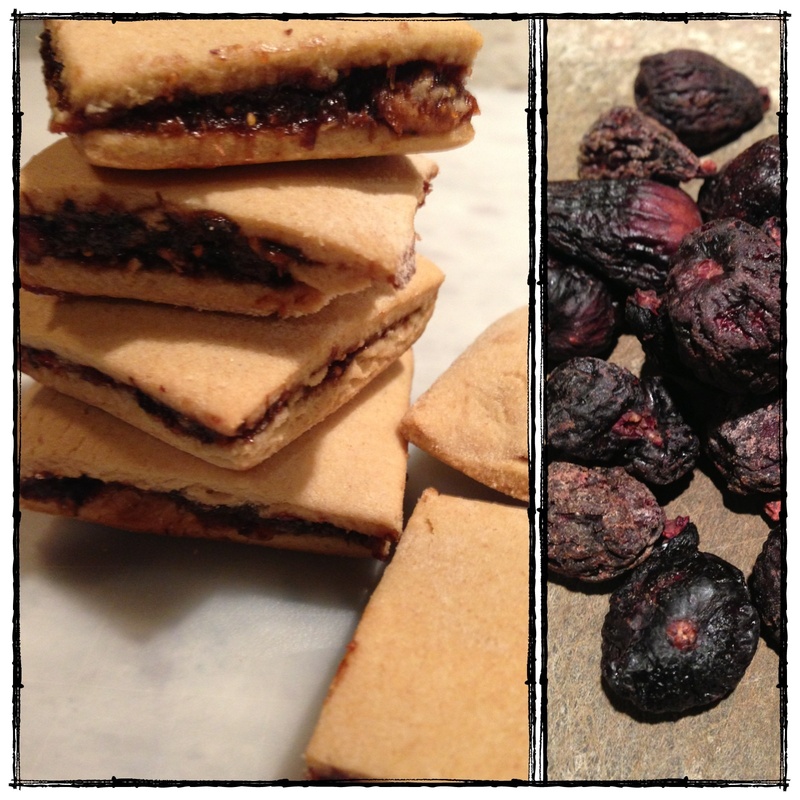 But I’m thankful to be able to do both – so tonight we made our own fig bars. 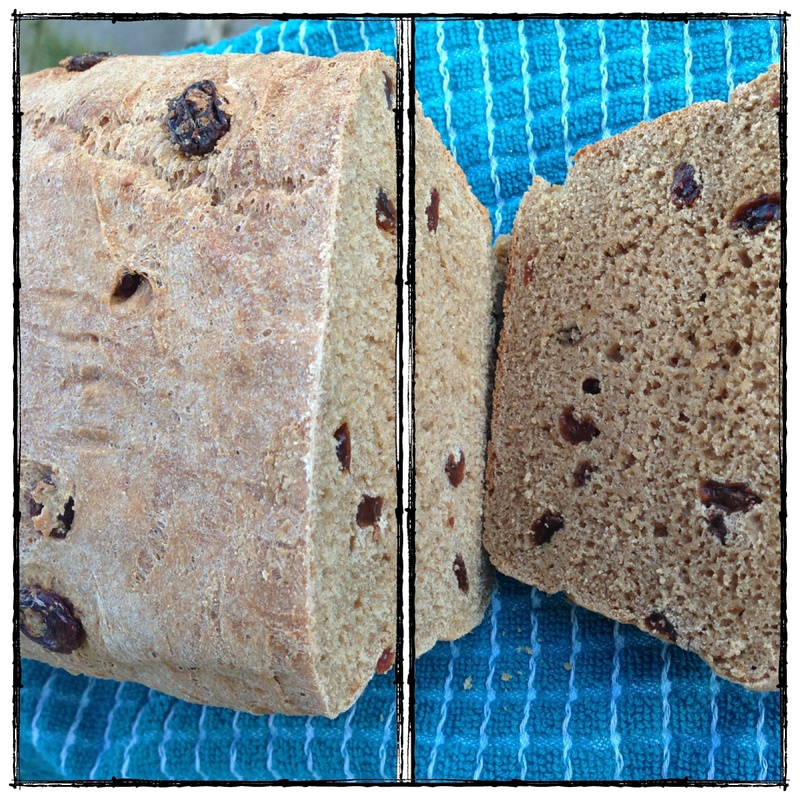 With whole wheat flour and honey. And organic dried, unsweetened figs. And they taste amazing. I adapted this recipe from my amazing friend Nicole. I CrossFit with her, and she is strong and lovely. 2. Places the figs in a small bowl, cover with hot water, and soak for 10 minutes. 3. Remove the figs from the water with a slotted spoon and place in food processor. Add 1 tablespoon honey, and about 1 tablespoon of the soaking liquid. Puree until smooth and spreadable. 4. 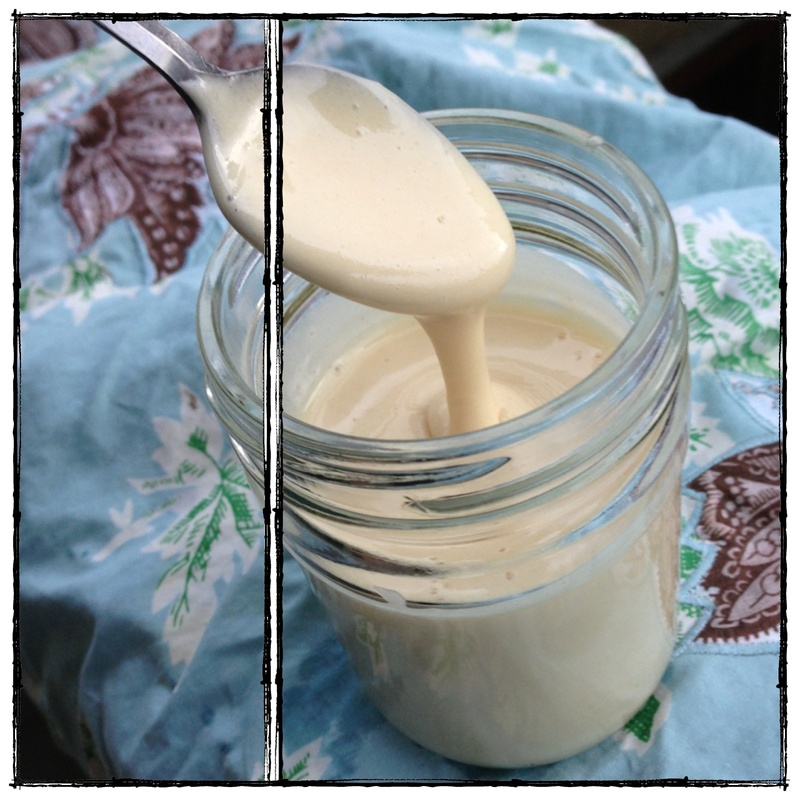 Using your mixer, or by hand, whisk together 1/3 cup honey, egg, vanilla, and butter until well incorporated. 5. Add the flour and mix until a dough forms. 6. Roll dough between two pieces of parchment paper, creating a large rectangle. It may help to flour your parchment paper so that the dough doesn’t stick. 7. Spread the fix mixture evenly on 1/2 of the rectangle. Leave a 1/4 inch border at the edge. 8. Fold the dough over on top of itself and gently press the dough together at the edges. 9. Cut the rectangle into even squares (makes 20-25 bars depending on how large you cut your squares). 10. Place on parchment lined baking sheet, and bake 15-20 minutes, or until golden brown.